eCurry's (off the bat, how brilliant, right?!) Soma is one friend I can rely on when I am out and about and have a question that demands an undelayed, urgent answer. Such an urgency came up when I was roaming around the Indian grocer's and asked Soma which bean were we discussing the other day? The entire conversation via twitter mind you (@Soma_R), is strewn with much silliness and laughter, but Soma answered, yellow hulled mung beans, as I was only familiar with the green ones. She further suggested I roast the hulled yellow mung beans prior to cooking to bring out their full bodied flavor. What I love about Soma is not only the light hearted spirit and happiness she projects but also her meticulous suggestions and techniques and uncompromising high standards she shows throughout her site, whether in her cooking, photography or raising her two daughters so beautifully. When you think of Soma you immediately think of her native Indian cuisine, but while she perfected Naan, she simultaneously perfected Asian Pancakes and Middle Eastern Homemade Pitas. Speaking of techniques, I was mesmerized by a couple she presented here in this post but please make sure to take every word she has written in as Soma has a knack for storytelling! Please make sure to follow eCurry on Facebook as well as on Twitter and check out the posts of the four ladies who preceded Soma in the India Series. Sharing a laughter, being kind and making each other happy are some integral characteristics of friendship, and that is what I share with Shulie. I met her in Twitter-land less than a year ago and we share conversation and laughs as we would do if we were sitting on a couch and chatting like old friends do. Doing a guest post for her wonderful blog is exciting and I am truly honored that she cared to ask me. Calcutta or Kolkata, The City of Joy is a city known by many names and painted in many hues. It is also the place which I call home and where I spent the first 21 years of my life. If you have had your hands on The City of Joy by Dominique Lapierre, you would know what I am talking about. It is a place that embraces a stranger with warmth and love. The former capital of British India, Kolkata is an intriguing collage of the British imperial culture and architecture combined with the rich Bengali traditions, philosophy and literature, and intertwined with all the elements of the modern life. It is obviously a place woven with magic for me. So when Shulie asked me to contribute to her Indian Street Food series, I could think of nothing else but these Egg Rolls, without which the streets of Kolkata are unthinkable. No I am not talking about the delicious little neatly rolled crispy Asian rolls. 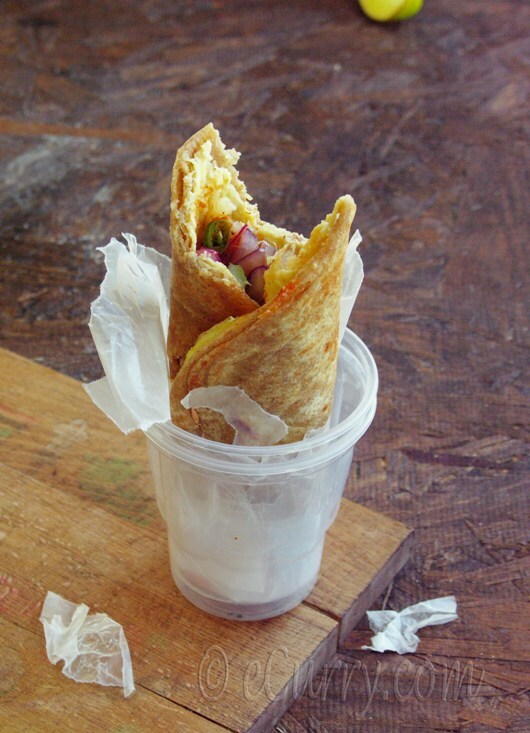 What I have here for you today is a roll, that sells like hot cake in both the upscale and obscure street corners and alleys of Kolkata, mostly on street carts or tiny corner shops. The sellers are swift and efficient, cooking up multiple parathas (layered bread cooked on a griddle) in one huge skillet, simultaneously breaking eggs with a single tap with immense perfection and rolling up the “Rolls” to hand them over to eager waiting hands, wrapped in a thin pale paper. So you see, they are more of a “Wrap” than a “Roll” - a “wrap” snug with comfort, a “wrap” just for you, with love from the streets of Kolkata. while the Rolls get cooked…. 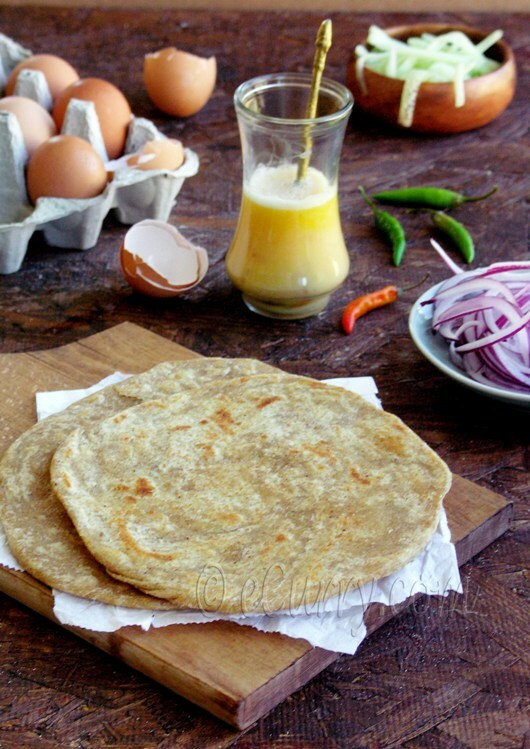 The whisked egg is poured out on hot oil, like you would do an Omelet and the Paratha is placed right on the top of it, while the egg is still cooking. The wrap will feel hot to your fingers, so hot that you have to switch hands for the first few seconds. You only tear a little swirl at a time and the first bite is bliss; you have to trust me on this. It is a complete meal - filling and fulfilling at the same time. And you see, us those who hail from the Calcutta (Kolkata now) – The City of Joy in real sense, never ever tire of this! I have loved them as a child, had innumerable of them while in college and crave for them even now. Since I am away from home for many years now, and I miss the street stalls, I have to make my own Egg Rolls. It has not been difficult to reciprocate the street side taste, (well except for the ketchup, for they do have some secret ingredient in those bottles which might not be healthy but tastes darn good)… for I have seen these made over and over again. [Note: The parathas need to be on the thicker side, unlike the tortillas. There should be a good amount of bite to it. So do not roll them out too thin. 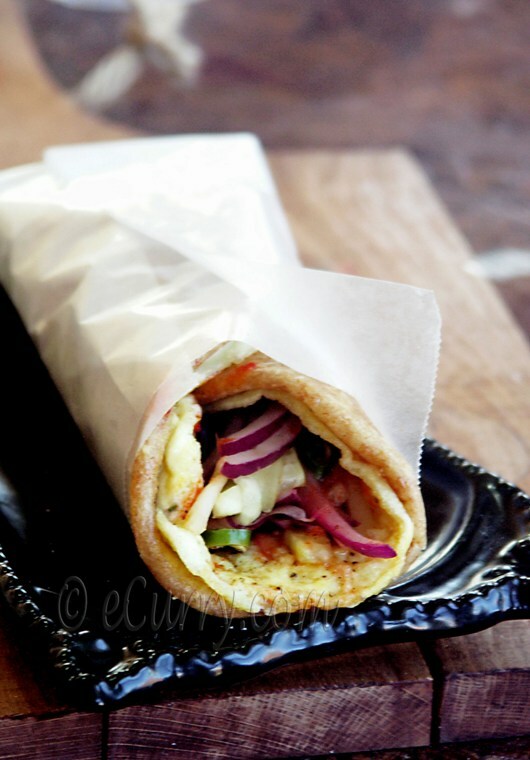 These are layered flatbreads and needs to be made as I have done for the authentic street side taste. All purpose flour is used here instead of whole wheat and that is how it is done; to give the bread a chewy stretchy feel instead of them being crisp. Sieve the flour and salt together in bowl. Rub in the oil until the flour forms crumbs; add warm water gradually, a little at a time. Knead until smooth. Cover well and leave aside for about 30 minutes to an hour. Punch down the dough and knead it again for a couple of minutes; divide the dough into 4 portions. Shape each into a round ball. Flatten the spheres. Roll out each flattened ball into a circle of 8 inch diameter or as thin as you can get them without tearing. You should be able to pick up the rolled dough without tearing. Brush some oil on the surface of the dough, evenly dust some flour on the rolled dough. Start from one end; hold the left and right side of the end with fingers and then start pleating, like doing a paper fan. Pleat into small folds as these folds are finally going to be the folds bread; so the more you do the more layers you will have. (Try to pleat 6-8 times.) Once you have reached the other end, it will look like a rope. Press both the ends with your finger tips. Pick up the rope carefully by holding the the ends, and now twist it, about 5-7 times. Each hand should move in opposite direction (think of the looks of twisted bread stick or wringing water out of a towel). Now lay it down on the board and start rolling it in to a spiral snail like shape; roll until you have reached the end. Take the end tip and press it down on the top or the sides, so it does not open while rolling. Flatten it with your palm. Dust the board with more flour and roll it carefully without pressing too hard into 5″ -6″ (diameter) circles. Heat a tava/griddle and cook the rolled dough lightly (on medium heat) on both sides. When you see tiny brown spots appear, reduce the heat and brush on about half to one teaspoon of oil and flip it over. You will see the bread starting to puff – at spots or the whole bread will start puffing up. Press down gently with a spatula until the underside is golden with light brown spots. Now again apply half to one teaspoon of oil on the top, flip it over and cook this side in the same way as you did the other side. 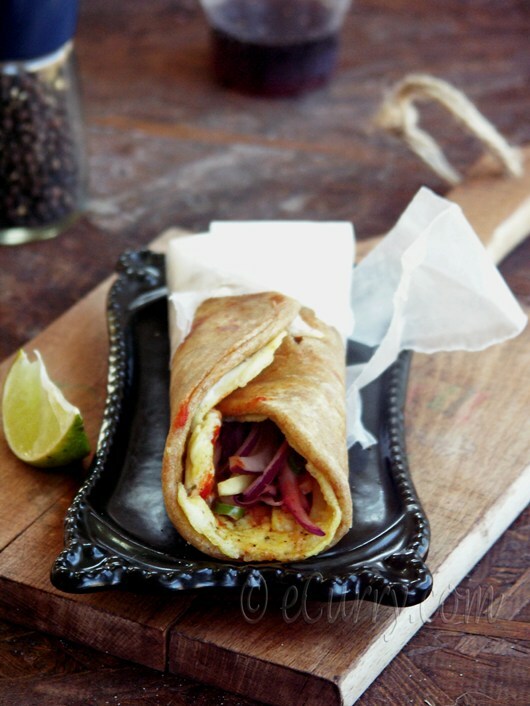 Try not to crisp the paratha, as it gets difficult to roll them up. The parathas should be cooked, but soft and pliable and that is why it is needed to watch the temperature. Switch between medium to low temperature, not high. The parathas may be cooked before hand and refrigerated too (though fresh ones taste the best). Just make sure they come down to room temperature before you are ready to make the rolls. Cook them a bit longer than you would do the fresh ones while you are making the rolls – just to have them warm enough. If you do not want the heat and the spice from the onions, soak the sliced onions in water for about 15 minutes. Drain and dry them with a paper towel. Whisk the egg with salt and black pepper. Coat a pan with oil. 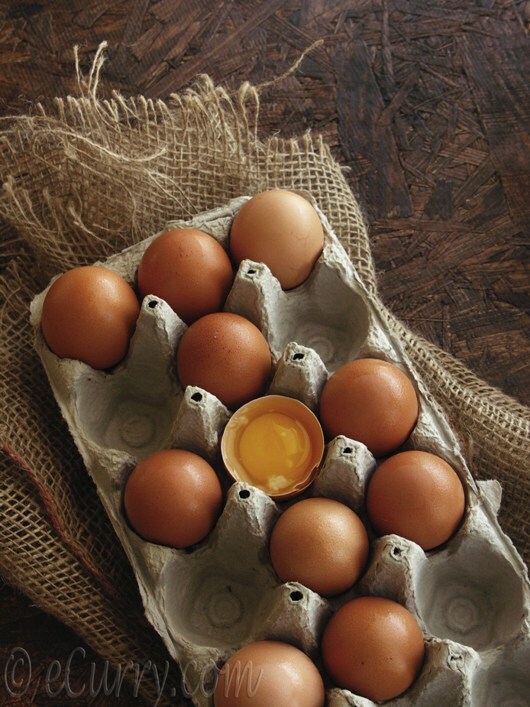 Gently heat the pan, reduce the heat and pour the egg and swirl it in to a circular shape. 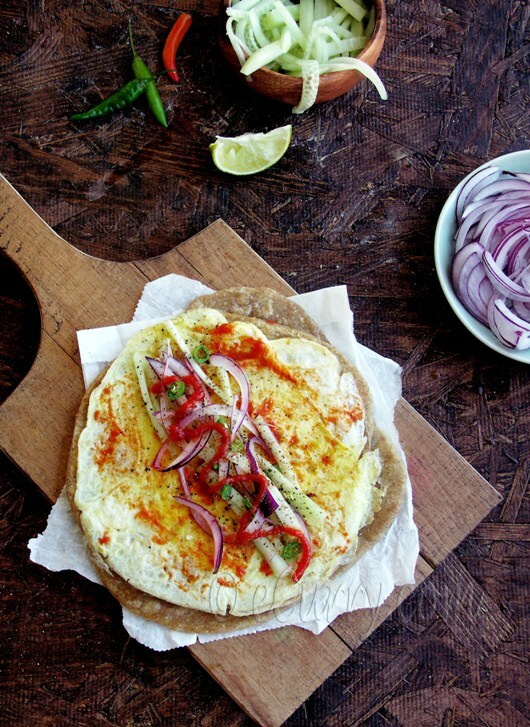 Place a paratha straight over the uncooked egg and let the egg cook until the underside is solid and yellow. 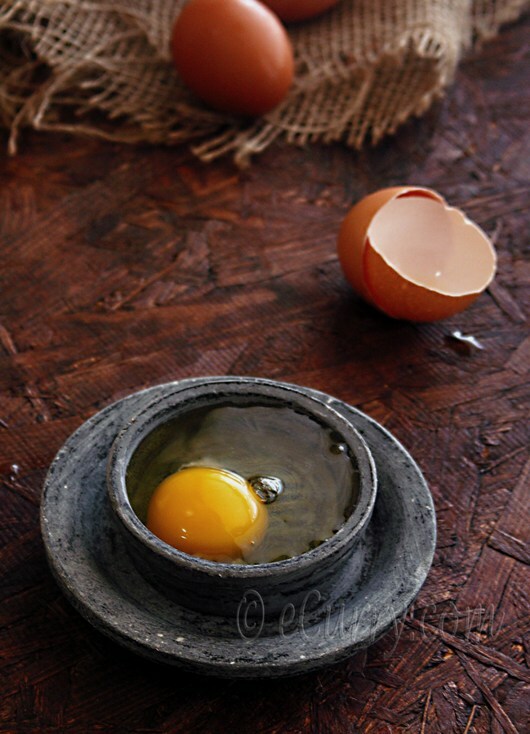 Do not let the egg brown and that is why it is important to cook it at low heat. Once the egg is cooked and it should take only a few minutes, slide a spatula under the egg, flip it over and cook the paratha on the pan for a few seconds while pressing down on the egg/and the paratha (the paratha should have been stuck to the egg while the egg was cooking), just long enough to heat the paratha. Remove from the pan; and place it on a plate egg side up. Smear the egg with a dollop of ketchup/tomato sauce/hot sauce. Place some thinly sliced red onions, thinly sliced cucumber, and very thinly sliced hot chili peppers in a line along the center. Swirl some ketchup/hot sauce over the line of onion, cucumber and peppers. 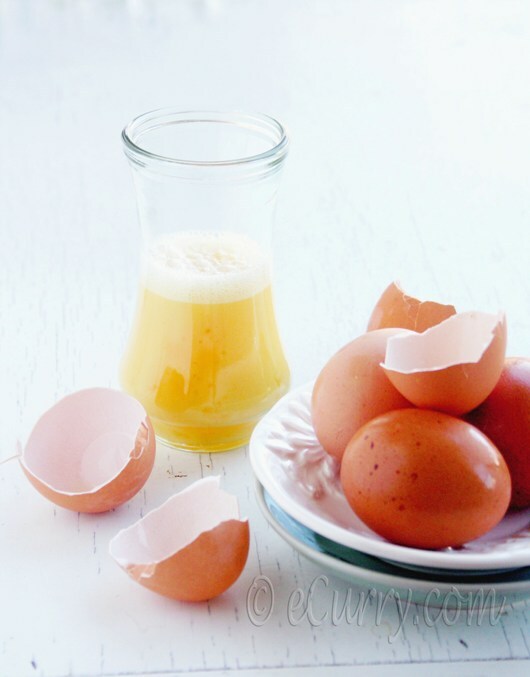 Drizzle some fresh lemon juice over the entire egg. Add a good sprinkle of some freshly ground pepper and some salt to taste. 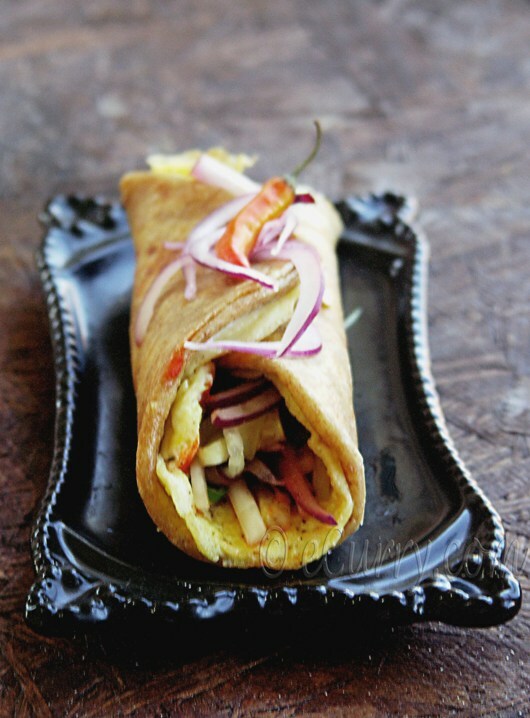 Fold the underside of the paratha a tiny bit (this helps seal the end while rolling and prevents the salad from sliding out while eating), and roll the paratha with the onion, cucumber, pepper inside as you would do to a wrap. 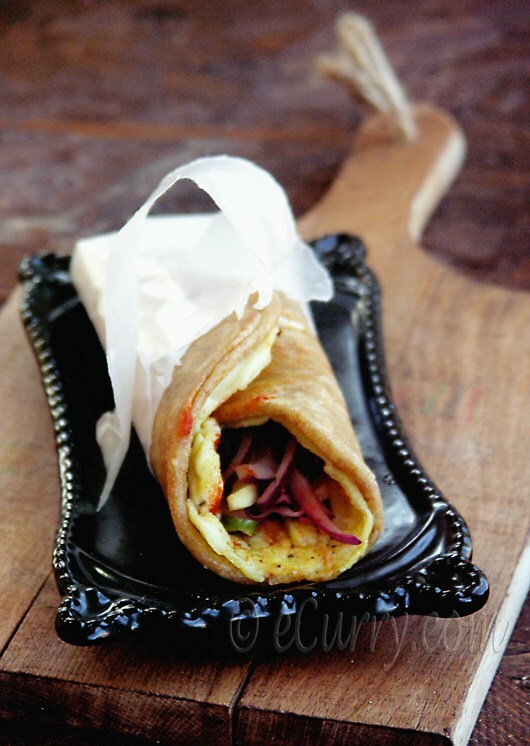 Wrap the rolled paratha in a foil or parchment paper and serve immediately. 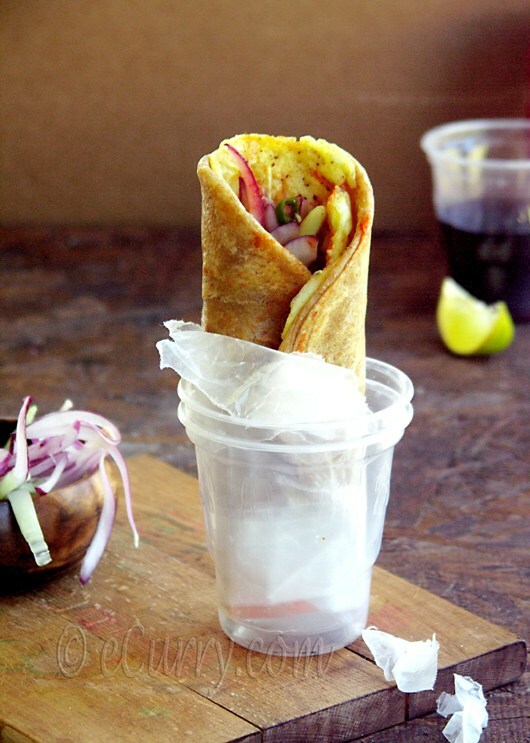 i'm enjoying the street food series ! 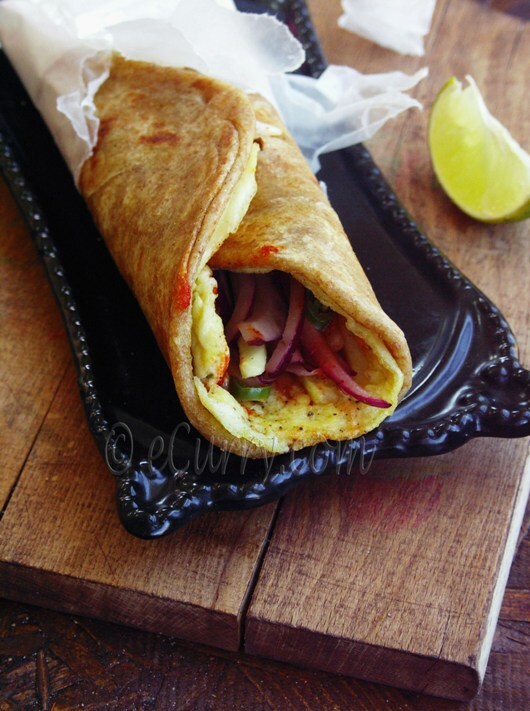 both of you are awesome...i love wraps..n this one has me drooling :D great post ! Shulie! Thank you my lovely friend for giving me this opportunity :) xoxo and thank you for those beautiful words. I love egg rolls! And I love how different countries have variations on their own. We,Filipinos have our tiny, crispy "egg rolls". Then just a few hours ago, was making Vietnamese egg rolls. And now, this ispires me to try your recipe, too! Fantastic, Shulie! What a gorgeous post. Drool-worthy for certain!! I love reading friendship stories that were forged via Twitter. 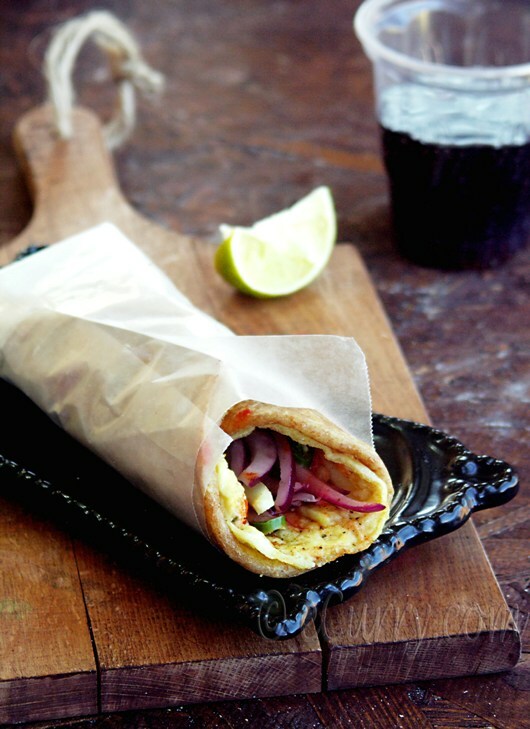 This is so delicious, I just know it, and I have the perfect red onions for the filling! I'll let you know how mine turns out! Soma-Your Egg Rolls look fantastic. 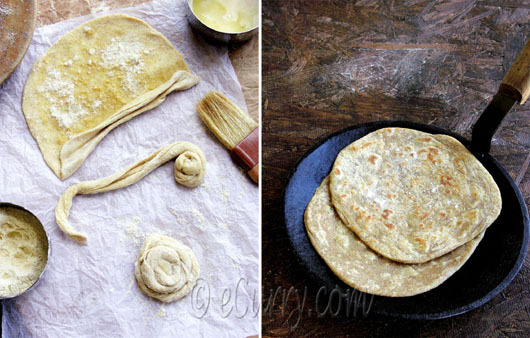 I would love to try your parantha recipe. They must be delicious! Thank you for this journey to Kolkata with your words and beautiful photos. I love the look of parathas. Beautiful post. This is the kind of lunch we could eat every day. The wrap looks so delicious...but are we limited to just one? Fabulous! Hello there..Came through Soma.That's so wonderful of you to come up with something so brilliant together.I appreciate that. egg rolls a re a staple in my house and every other week we need to have our dose. Such quick, filling thing. Love it. Loved seeing you guys together! I love egg rolls every now and then! Soma is a great friend and her pictures and recipes are just as fabulous as her. This egg roll is no exception. Love how she's shown pictures of making the paratha. I love Soma and you are right about how beautifully she explains everything. I have learned so much from her. Love these! They are the perfect portable meal. Love seeing Soma here! love your street food series. Awesome photo! These look absolutely delicious! And the photography is just beautiful. Elizatbeth: It is indeed amazing how something with the same name are so different in diff. corners of the world. Annapet: I hope you get to try these sometimes. Jenn: It means a lot coming from you. Tickked Red: I do hope that you get to visit India sometimes.Thank you! Anonymous: Thank you! glad that you liked it. This sounds amazing and the parathas sound delicious - definitely a technique I want to try!!! This blog are Awesome.. I love foods.. they are so tasty and delicious…!